The refurbishment of Papanui Primary School was part of the Christchurch Schools Rebuild (CSR) programme. 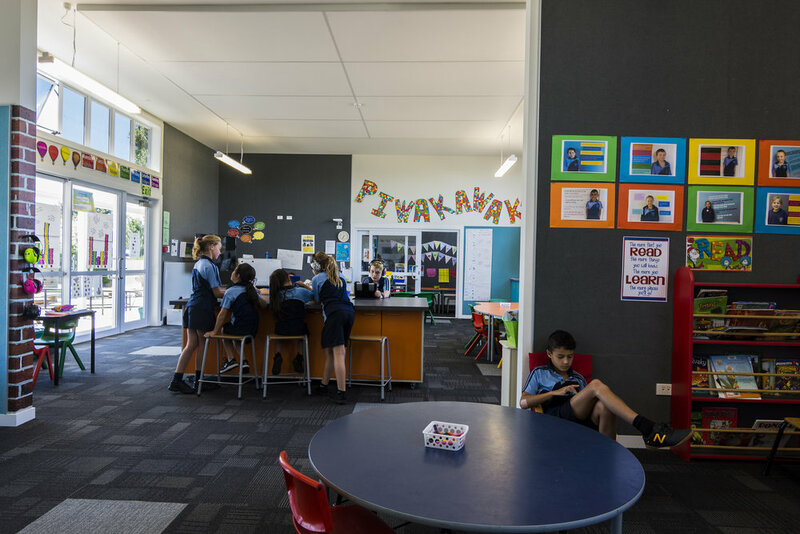 Papanui Primary School was clustered with six other schools in order to encourage contractor interest through larger budgets and work spread over an extended timeframe. S&T worked closely with the school to establish the pedagogical requirements they desired within their new learning spaces and within the MoE’s guidelines. A building stock review was also undertaken to help in the establishment of the design process. The three main buildings (Blocks 1, 2 and 6) were refurbished to transform the existing traditional classrooms into Innovative Learning Environments (ILEs). Other key items considered in the project design included improving the circulation within Block 1 along with providing greater access and engagement to learning outdoors. This was done by creating collaborative spaces (in close proximity to the main learning spaces) to enable teachers to prepare topics. Different spaces were defined through furniture and joinery and the improvement in the school’s acoustics also supported the success of the mixture of the larger collaborative and smaller focused learning spaces. The design scope also included creating a new staffroom area. The removal of walls allowed for a series of inter-connected learning spaces, supported by smaller spaces that can be closed off for quieter learning. The larger learning areas are divided into different zones through brightly coloured joinery and through small sections of walls which create nooks and focused areas for specific activites while remaining connected with the larger space. The conscious placement of glazed doors helped to establish visual interconnectivity between the learning spaces and provides the option of opening classrooms to both the outdoors and to the neighbouring interiors. Joinery (both fixed and moveable) allows storage to be strategically hidden away while being easily at hand, meaning the learning spaces are open and ideally uncluttered. Weathertightness and structural remediation work was also addressed as part of the refurbishment. Principal, Paul Kingston comments "that the children, teachers and the community are thrilled with their modernised learning spaces and excited as we begin to realise their potential".